The pharynx is part of the digestive and respiratory systems and consists of three main parts: the nasopharynx, oropharynx, and laryngopharynx. The human pharynx (plural: pharynges) is the part of the throat situated immediately inferior to (below) the mouth and nasal cavity, and superior to the esophagus and larynx. The human pharynx is conventionally divided into three sections: the nasopharynx (epipharynx), the oropharynx (mesopharynx), and the laryngopharynx (hypopharynx). The nasopharynx extends from the base of the skull to the upper surface of the soft palate. Adenoids are lymphoid tissue structures located in the posterior wall of the nasopharynx. The nasopharynx communicates with the middle ear, nasal cavities, and auditory tube. The oropharynx lies behind the oral cavity and extends from the uvula to the level of the hyoid bone. A flap of connective tissue called the epiglottis closes over the glottis when food is swallowed to prevent aspiration. The laryngopharynx is the caudal part of the pharynx; it is the part of the throat that connects to the esophagus. It includes three major sites: the pyriform sinus, the postcricoid area, and the posterior pharyngeal wall. adenoid: One of the two folds of lymphatic tissue covered by ciliated epithelium. They are found in the roof and posterior wall of the nasopharynx at the back of the throat behind the uvula. They may obstruct normal breathing and make speech difficult when swollen—a condition often called adenitis. epiglottis: A cartilaginous organ in the throat of terrestrial vertebrates that covers the glottis when swallowing to prevent food and liquid from entering the trachea. In Homo sapiens it is also a speech organ. uvula: The fleshy appendage that hangs from the back of the palate and closes the nasopharynx during swallowing. 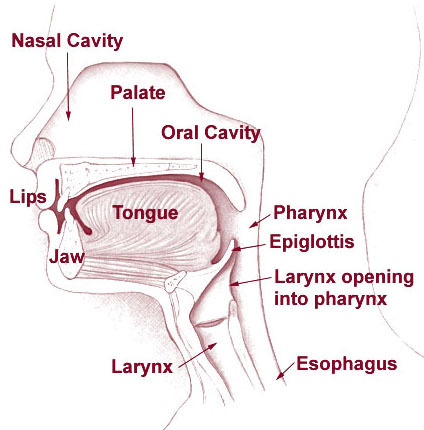 pharynx: The part of the alimentary canal that extends from the mouth and nasal cavities to the larynx, where it becomes continuous with the esophagus. Head and neck overview: The human pharynx is situated immediately below the mouth and nasal cavity, and above the esophagus and larynx. The human pharynx is conventionally divided into three sections: the nasopharynx (epipharynx), the oropharynx (mesopharynx), and the laryngopharynx (hypopharynx). The pharynx is part of the digestive system and also the respiratory system, as well as an important part in vocalization. The nasopharynx is the most cephalad (toward the head) portion of the pharynx. It extends from the base of the skull to the upper surface of the soft palate. It includes the space between the internal nares and the soft palate, and lies superior to the oral cavity. The pharyngeal tonsils, more commonly referred to as the adenoids, are lymphoid tissue structures located in the posterior wall of the nasopharynx. Polyps or mucus can obstruct the nasopharynx, as can congestion due to an upper respiratory infection. The eustachian tubes connect the middle ear to the pharynx and open into the nasopharynx. The opening and closing of the eustachian tubes serves to equalize the barometric pressure in the middle ear with that of the ambient atmosphere. The anterior portion of the nasopharynx connects with the nasal cavities through openings known as choanae. The nasopharynx and its associated nasal tissues are lined with ciliated pseudostratified columnar epithelium, which is excellent for sweeping debris from the nasal passages. On the lateral walls of the nasopharynx are the pharyngeal ostia of the auditory tube—triangle-shaped openings bound from behind by a firm prominence called the torus tubarius or cushion. The salpingopharyngeal fold, a vertical fold of mucous membrane that extends from the inferior part of the torus. The salpingopalatine fold, a smaller fold that extends from the superior part of the torus to the palate. Behind the ostia of the auditory tube is a deep recess known as the pharyngeal recess (or fossa of Rosenmüller). The posterior wall of the nasopharynx holds the pharyngeal tonsils, which can be especially marked in childhood. Superior to the pharyngeal tonsil, in the midline, an irregular flask-shaped depression of the mucous membrane sometimes extends upward; it is known as the pharyngeal bursa. The oropharynx or mesopharynx lies behind the oral cavity and extends from the uvula to the level of the hyoid bone. It opens anteriorly, through the isthmus faucium, into the mouth, and contains the palatine tonsil—another grouping of adenoid tissue. The anterior wall consists of the base of the tongue and the the epiglottis tissue. The lateral walls are made up of the tonsil and associated tonsilar tissues. The superior wall consists of the inferior surface of the soft palate and the uvula. Because both food and air pass through the pharynx, a flap of connective tissue called the epiglottis closes over the glottis (tracheal opening) when food is swallowed to prevent accidental inhalation. The oropharynx is lined by non-keratinized stratified squamous epithelium. The hypopharynx or laryngopharynx is the caudal (most inferior) part of the pharynx; it is the part of the throat that connects to the esophagus. It lies inferior to the epiglottis and extends to the location where this common pathway diverges into the respiratory (larynx) and digestive (esophagus) pathways. At that point, the laryngopharynx is continuous with the esophagus posteriorly. The esophagus conducts food and fluids to the stomach; air enters the larynx anteriorly. During swallowing, food has the right of way and air passage temporarily stops. Like the oropharynx above it, the laryngopharynx serves as a passageway for food and air and is lined with a stratified squamous epithelium.